The marginal effects of acute kidney injury on in-hospital mortality, length of stay (LOS), and costs have not been well described. A consecutive sample of 19,982 adults who were admitted to an urban academic medical center, including 9210 who had two or more serum creatinine (SCr) determinations, was evaluated. The presence and degree of acute kidney injury were assessed using absolute and relative increases from baseline to peak SCr concentration during hospitalization. Large increases in SCr concentration were relatively rare (e.g., ≥2.0 mg/dl in 105 [1%] patients), whereas more modest increases in SCr were common (e.g., ≥0.5 mg/dl in 1237 [13%] patients). Modest changes in SCr were significantly associated with mortality, LOS, and costs, even after adjustment for age, gender, admission International Classification of Diseases, Ninth Revision, Clinical Modification diagnosis, severity of illness (diagnosis-related group weight), and chronic kidney disease. For example, an increase in SCr ≥0.5 mg/dl was associated with a 6.5-fold (95% confidence interval 5.0 to 8.5) increase in the odds of death, a 3.5-d increase in LOS, and nearly $7500 in excess hospital costs. Acute kidney injury is associated with significantly increased mortality, LOS, and costs across a broad spectrum of conditions. Moreover, outcomes are related directly to the severity of acute kidney injury, whether characterized by nominal or percentage changes in serum creatinine. Acute kidney injury (AKI) has been reported in 5 to 7% of hospitalized patients on the basis of several single-center reports (1,2). Despite the perception that AKI is relatively common, there is no uniform definition for AKI, and relatively few data regarding its incidence in hospitalized patients are available. Moreover, the relative effects of AKI on mortality, hospital length of stay (LOS), and costs have not been well described. Most studies that have explored downstream effects of AKI have either considered AKI requiring dialysis or homogenous patient populations, such as those who were exposed to radiocontrast agents or undergoing cardiothoracic surgery. In the context of a computer-based intervention in which data were collected on kidney function, severity of illness, drug prescription, and outcomes in hospitalized patients (3), we linked changes in serum creatinine (SCr) with in-hospital mortality, LOS, and costs. We hypothesized that relatively small changes in SCr would be common and associated with adverse outcomes, even after adjustment for severity of disease. The study was conducted at Brigham and Women’s Hospital, a 720-bed urban academic medical center in Boston, MA. Data were obtained for a study to examine the effects of a computer-order entry-based decision tool on drug prescribing for hospitalized patients with impaired kidney function (3). As part of the data library collected for evaluation of the appropriateness of drug prescription, serial SCr determinations were collected on a consecutive series of hospitalized patients on the medical, surgical (including subspecialty surgical services), neurology, and obstetrics and gynecology services between September 1997 and April 1998. There were 19,982 admissions in which at least one SCr was obtained. For 9210 (46%) admissions, SCr was determined two or more times. Five (0.05%) admissions were excluded because vital status was unknown at discharge. The number of SCr determinations ranged from two to 92. Routinely available demographic factors, specific drug prescriptions, Center for Medicare and Medicaid Services diagnosis-related group (DRG) weights (a proxy for disease severity ), LOS, hospital charges, itemized costs, and vital status at hospital discharge were also collected. For the purpose of these analyses, we additionally obtained primary International Classification of Diseases, Ninth Revision, Clinical Modification (ICD-9-CM) codes for each hospitalization. We categorized the ICD-9-CM codes according to conventional methods. For risk adjustment, we grouped diagnoses into “diseases of the circulatory system,” “diseases of the respiratory system,” “diseases of the gastrointestinal system,” “infectious diseases,” “neoplasms,” and all others, with the last group as the referent category. We considered people whose gender-stratified admission SCr was above the 90th percentile as “chronic kidney disease (CKD),” except when the admission ICD-9-CM code was 580, 584, or 788, potentially indicating community-acquired AKI. The CKD designation included men with SCr ≥ 1.6 mg/dl and women with SCr ≥ 1.4 mg/dl. We estimated baseline creatinine clearance using the Cockcroft-Gault equation, incorporating SCr, age, gender, and body weight (5). To help determine the presence and severity of AKI, we calculated the difference between peak and baseline SCr concentrations. For individuals with only two SCr determinations, the second, when higher than the first, was considered the peak. We assumed that individuals with no further monitoring or change in SCr had not experienced AKI. For individuals with more than two SCr determinations, we considered the minimum of the first three as baseline and the maximum of the second through nth as peak. We considered nominal changes in SCr, percentage changes, percentage changes to a minimum peak, and other previously used algorithms that incorporated the exponential relation between SCr and GFR. Finally, we broadly classified individuals by a combination of ICD-9-CM diagnosis codes and prescribed medications as potentially associated with reduced renal perfusion (“prerenal”) versus intrinsic renal injury. Continuous variables are described as mean ± SD or median with interquartile range and compared with t test or the Wilcoxon rank sum test, when appropriate. Categorical variables are described as proportions and compared with the χ2 test. We used logistic regression to estimate the odds of death with AKI, adjusting for associations with age, gender, DRG weight, ICD-9-CM group, and CKD. Because death was relatively common among patients with large increases in SCr, risk ratios were estimated using the method of Zhang and Yu (6). Model discrimination was determined using the area under the receiver operating characteristic curve (7). Model fit was assessed with the Hosmer-Lemeshow goodness-of-fit test (8). We used linear regression analysis to evaluate the associations of AKI with hospital LOS and costs. We log-transformed LOS and costs to accommodate data that were expectedly right-skewed and used Mallow’s Cp to assess model fit. Residual diagnostics indicated few outliers. We tested multiplicative interaction terms of AKI with other model covariates to evaluate for effect modification. To determine whether the risk associated with AKI differed by presumed cause (prerenal versus other), we used the Breslow-Day test for homogeneity of odds ratios (OR) and added an AKI × cause interaction term to multivariable models. Given that we were exploring multiple definitions of AKI and three outcome variables, we considered two-tailed P < 0.01 to be statistically significant. Statistical analyses were conducted using SAS 8.2 (SAS Institute, Cary, NC). There were 19,982 admissions with one or more SCr determinations during the study period and 9205 with two or more (Table 1). Patients with two or more SCr determinations were more likely to be admitted with cardiovascular diseases, neoplasms, and respiratory diseases and less likely to be admitted for musculoskeletal diseases and issues related to pregnancy (Figure 1). No patients were admitted with a primary ICD-9-CM code of 585 (ESRD). As expected, disease severity was higher among patients with two or more SCr determinations, as were hospital LOS, total costs, and mortality. Of the 9205 patients with two or more SCr determinations, 7166 (78%), 5780 (63%), and 4682 (51%) had three, four, and five or more SCr determinations. More than 10% of the sample (938) had 15 or more SCr determinations. Patients with AKI were significantly older, had lower baseline creatinine clearances, and had higher severity of illness. The fraction of admissions with AKI differed significantly by ICD-9-CM category (P < 0.0001). The incidence of AKI (e.g., increase in SCr ≥0.5 mg/dl) was highest among patients with cardiovascular diseases (20%); infectious diseases (18%); skin and soft tissue diseases (15%); endocrine, nutritional, and metabolic diseases (13%); respiratory diseases (12%); genitourinary diseases (12%); and injuries and poisoning (12%). Table 2 shows the unadjusted, age- and gender-adjusted, and multivariable-adjusted OR associated with AKI when AKI was determined by changes in SCr. Older patients and patients with CKD, higher disease severity, and admission diagnoses in the infectious disease, respiratory, gastrointestinal, and malignancy ICD-9-CM categories had an increased risk for death. For the model that used a change in SCr of ≥0.5 mg/dl, the risks for death were higher for women than men (P = 0.004 for interaction) and for patients with de novo AKI compared with AKI superimposed on CKD (P = 0.001 for interaction). In models that used percentage change in SCr concentration (e.g., ≥50% increase in SCr), these interactions were not statistically significant. Discrimination and calibration were similar for models that used nominal and percentage changes in SCr (Table 2). The OR associated with AKI was independent of the proxy for prerenal versus other causes (Breslow-Day χ2, P = 0.56). The OR associated with AKI was significantly increased across all major ICD-9-CM diagnosis categories. Compared with respiratory, infectious, gastrointestinal, malignant, and other diseases, the adjusted OR associated with AKI was attenuated in patients who were admitted with cardiovascular disease (OR 4.3; 95% confidence interval [CI], 2.7 to 6.8), although the AKI × cardiovascular disease interaction was of marginal statistical significance (P = 0.02). There were no other significant interactions by ICD-9-CM code. LOS (another proxy for severity) was not significantly associated with mortality when added to these models. Forced inclusion of LOS augmented the OR estimates for AKI. We performed additional analyses to compare different incremental changes in SCr. Figure 2 shows the unadjusted, age- and gender-adjusted, and multivariable-adjusted OR associated with increases in SCr of 0.3 to 0.4, 0.5 to 0.9, 1.0 to 1.9, and ≥2.0 mg/dl, relative to patients with little or no change in SCr. It is noteworthy that even very small increases in SCr (0.3 to 0.4 mg/dl) were significantly associated with mortality (multivariable OR 1.7; 95% CI, 1.2 to 2.6). We evaluated the risk for AKI in subcohorts of patients with three, four, and five or more SCr determinations (cohorts with corresponding overall mortality rates of 3.7, 4.3, and 4.7%, respectively). Compared with an adjusted OR of 6.5 (95% CI, 5.0 to 8.5) in the full cohort, corresponding OR for AKI were 6.4 (95% CI, 4.9 to 8.5), 6.5 (95% CI, 4.9 to 8.7), and 6.5 (95% CI, 4.8 to 8.9) in subcohorts of patients with three or more, four or more, and five or more SCr determinations. Finally, we conducted analyses that considered changes in SCr over the initial 7 ± 2 d of hospitalization. This method of AKI classification decreased the number of patients with AKI (n = 1098 [12%], n = 242 [3%], and n = 45 [0.5%] for increases in SCr of ≥0.5, ≥1.0, and ≥2.0 mg/dl, respectively). The corresponding multivariable OR for death associated with AKI were 4.3 (95% CI, 3.3 to 5.6), 5.9 (95% CI, 4.1 to 8.5), and 5.9 (95% CI, 2.8 to 12.4). DRG weight was the strongest predictor of hospital LOS. Nevertheless, AKI was consistently associated with an independent increase in LOS. Using the ≥0.5 mg/dl increase in SCr criterion, we observed a 3.5-d increase in hospital LOS (P < 0.0001). In LOS models, there were no interactions among AKI, gender, and CKD. The models explained approximately 33% of the variance in LOS and were well fit. Larger increases in SCr were associated with longer relative increases in hospital LOS (e.g., 5.4 and 7.9 d with ≥1.0- and ≥2.0-mg/dl increases in SCr, respectively). In addition to AKI, DRG weight, CKD, and gastrointestinal and malignant diseases were associated with longer LOS. When we restricted the analysis to patients who survived, the relative increases in LOS were magnified (3.6, 5.8, and 9.0 d, for increases in SCr ≥0.5, ≥1.0, and ≥2.0 mg/dl, respectively). When we considered only those individuals with AKI during the 7 ± 2 d of hospitalization, the corresponding relative increases in LOS were 2.1, 2.8, and 4.6 d.
Table 3 shows unadjusted and multivariable-adjusted mean costs for hospitalization with and without AKI using corresponding changes in SCr. As with LOS, the dominant predictor of total hospital costs was DRG weight. Multivariable models explained >40% of the variation in total hospital costs. Figure 3 shows the unadjusted, age- and gender-adjusted, and multivariable-adjusted costs associated with incremental changes in SCr concentration. The cost results were robust, even with further adjustment for LOS. When LOS was included, the models explained >65% of the variation in costs. Relatively few studies have examined the incidence and fewer have examined the consequences of hospital-acquired AKI. The oft-cited study by Hou et al. (1) reported an AKI incidence of 5% (109 of 2216 medical and surgical patients). In that study, AKI was associated with decreased renal perfusion (42%), major surgery (18%), radiocontrast exposure (12%), and aminoglycoside administration (7%). Predictors of poor prognosis included oliguria and the severity of renal dysfunction (i.e., increase in SCr of >3.0 mg/dl). Nash et al. (9) recently updated this report, demonstrating a similar risk factor profile and an AKI incidence of 7% among hospitalized patients. Many studies have demonstrated an association between acute renal failure requiring dialysis and in-hospital mortality. Relatively few studies have examined the association between smaller changes in SCr and outcomes. Epidemiologic studies cannot provide a causal link between AKI and mortality. Acute kidney injury may be accompanied by acute lung injury and liver and other organ system failure, especially in critically ill patients. However, published studies have demonstrated a consistently high relative risk associated with AKI despite adjustment for comorbid conditions and severity of illness. Levy et al. (10) compared a Yale-New Haven Hospital cohort of 183 patients with radiocontrast-associated AKI and 174 patients who were matched for age and baseline SCr and underwent similar diagnostic procedures without developing AKI. The mortality rate was 34% in patients with AKI versus 7% in patients without AKI. Adjusting for differences in comorbidity, the odds of death were increased 5.5-fold in the AKI group. We have previously shown a 6.3-fold increase in the odds of death among 643 patients with amphotericin B–associated AKI (11). Several other groups have shown an association between very small changes in SCr and outcomes. Krumholz et al. (12,13) explored this issue in elderly individuals who were hospitalized with congestive heart failure, for whom small changes in SCr concentration have been associated with increased mortality and extended (>10 d) LOS. Recently, Lassnigg et al. (14) showed a two-fold increase in the risk for death for patients who experienced no change or a small increase (<0.5 mg/dl) in SCr 48 h after cardiothoracic surgery compared with patients who experienced a small decline in SCr during the same time frame. In a similar population, Loef et al. (15) showed an association between a 25% increase in SCr during the first postoperative week and short- and long-term (>8 yr) mortality. Our study extends these findings from previously published reports. We studied a larger cohort with a wide variety of reasons for hospitalization, evaluated associations with several perturbations in SCr, and evaluated associations with LOS and costs. In this study, although the associations with relatively large changes in SCr (e.g., ≥2.0 mg/dl) were most striking, large changes in SCr were relatively rare. In contrast, >30% of patients with two or more SCr determinations experienced an increase in SCr of 0.3 to 0.4 mg/dl. These individuals experienced a 70% increase in the risk for death relative to patients with little or no change in SCr. Because AKI has no uniform definition (and, consequently, no accurate estimate of incidence), we previously had little information on which to evaluate the public health or financial impact of AKI relative to other serious conditions. Although we estimated a considerable increase in cost associated with AKI in amphotericin B–treated individuals (approximately $30,000 per episode), this analysis considered an extreme clinical scenario and applied a single, arbitrary definition of AKI (50% increase in SCr to at least 2.0 mg/dl) (11). In contrast, the broad-based population that was evaluated in our study allows for estimation of the burden of AKI. The total annualized hospital costs for the 9205 patients with two or more SCr determinations was approximately $148,150,000, $13,167,000 (9%) of which was attributed to AKI using the ≥0.5-mg/dl change in SCr definition. This would represent roughly 5% of overall hospital costs when considering all admissions, including individuals with zero or one SCr determination. The National Center for Health Statistics estimated 122 hospital discharges per 1000 noninstitutionalized persons in the United States in 2001 (http://www.cdc.gov/nchs), corresponding to roughly 34,000,000 admissions per year. If we were to estimate conservatively the incidence of hospital-acquired AKI at 5% and consider average costs 20% below those observed here, then the estimated annual health care expenditures that were attributable to hospital-acquired AKI would exceed $10 billion. This study has several strengths. The findings of increased mortality, LOS, and costs were robust across age, gender, CKD and non-CKD, and ICD-9-CM group categories. A single laboratory was used, limiting interlaboratory error and misclassification. This study also has several important limitations. First, the method of estimating baseline and peak SCr may have overestimated the proportion of patients who were classified with AKI. However, such misclassification would have biased the associations among AKI, mortality, LOS, and costs toward the null so that the effect estimates presented here may be conservative. Second, we had relatively few available covariates. Nevertheless, the covariates that were applied in the analyses (DRG weight and ICD-9-CM codes) are commonly used risk adjusters that explained a large fraction of the variance. Whether adverse outcomes can be attributed directly to AKI or residual confounding by severity of disease is unknown. Although residual confounding could lessen the magnitude of the risk estimates, additional covariates would be extremely unlikely to extinguish OR in the 5 to 10 range. Fourth, we had no data on the physiology of AKI and used proxies to attempt to distinguish prerenal from other causes of AKI. In future studies, we could refine the prerenal versus other classification with additional physiologic data (e.g., BP, urine output, fractional excretion of sodium). Fifth, biochemical measures that are more sensitive to change in GFR (16) or novel imaging modalities (17) may prove to be more effective markers of early AKI. Finally, because the data were obtained in an urban tertiary care hospital, the results may not be fully generalizable to the universe of hospitalized patients. In summary, AKI is associated with significantly increased mortality, LOS, and costs across a broad spectrum of conditions. Moreover, outcomes are related directly to the severity of AKI, whether characterized by nominal or percentage changes in serum creatinine. Although less obvious to clinicians than severe AKI requiring dialysis, non–dialysis-requiring AKI may be of equal or greater importance from a public health perspective. Prevention and effective treatment of hospital-acquired AKI should be a national priority. ↵a Including combination diuretic agents. Distribution of admissions by International Classification of Diseases, Ninth Revision, Clinical Modification (ICD-9-CM) category. Teal bars refer to the sample of patients with one or more serum creatinine (SCr) determination(s); blue bars refer to the sample of patients with two or more SCr determinations. ID, infectious and parasitic disease; CA, neoplasms; EN, endocrine, nutritional, and metabolic diseases; BD, diseases of blood and blood forming organs; MT, mental disorders; NR, diseases of the nervous system; CV, diseases of the circulatory system; RP, diseases of the respiratory system; GI, diseases of the digestive system; GU, diseases of the genitourinary system; PG, complications of pregnancy, childbirth, and pureperium; SK, diseases of the skin and subcutaneous tissue; MS, diseases of the musculoskeletal system and connective tissue; CG, congenital anomalies; SS, symptoms, signs, and ill-defined conditions; IP, injury and poisoning. Mortality associated with change in serum creatinine. Green bars are unadjusted, blue bars are age and gender adjusted, and gray bars are multivariable adjusted. Multivariable analyses adjusted for age, gender, diagnosis-related group (DRG) weight, chronic kidney disease (CKD) status, and ICD-9-CM codes for respiratory, gastrointestinal, malignant, and infectious diseases; n = 1564, 885, 246, and 105 for change in SCr 0.3 to 0.4, 0.5 to 0.9, 1.0 to 1.9, and ≥2.0 mg/dl. Mean hospital costs associated with changes in SCr. 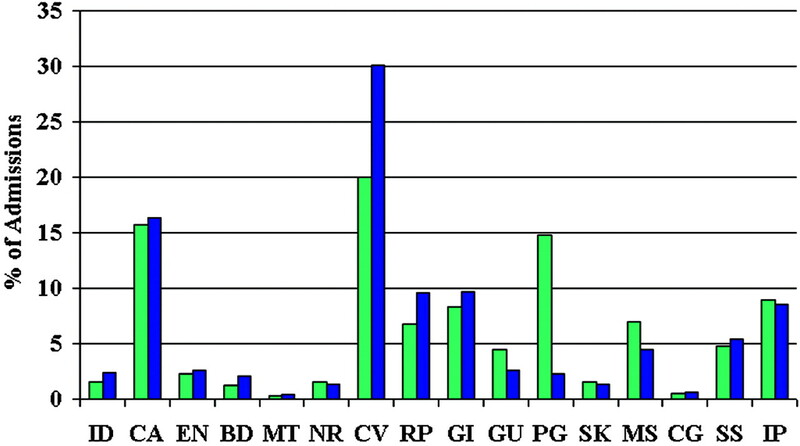 Green bars are unadjusted, blue bars are age and gender adjusted, and gray bars are multivariable adjusted. Multivariable analyses adjusted for age, gender, DRG weight, and ICD-9-CM codes for cardiovascular, respiratory, malignant, and infectious diseases; n = 1564, 885, 246, and 105 for change in SCr 0.3 to 0.4, 0.5 to 0.9, 1.0 to 1.9, and ≥2.0 mg/dl. This study was presented in abstract form at the 2003 American Society of Nephrology meetings; November 2003; San Diego, CA. See related editorial, “Towards a Definition and Classification of Acute Kidney Injury,” on pages 3149–3150. Nephrotoxicity of Polymyxins: Is There Any Difference between Colistimethate and Polymyxin B?